- Our Kumano Kodo self-guided tours offer 4, 5, or 6 days walking village to village along this old pilgrimage route heading west to east along the Kii-peninsula. 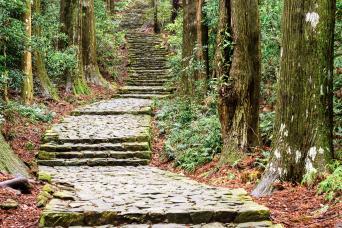 - Our Kumano to Koya self-guided tour offers 5 days of walking village to village along another wonderful section of the pilgrimage route leading from Kumano Hongu Taisha Shine to the spiritual Mount Koya, from south to north. 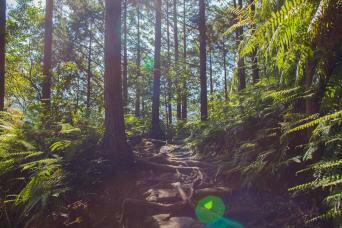 - Our Kumano Kodo Complete self-guided tours, taking in both the Nakahechi and Kohechi trails, with lengths of 9 or 11 days. 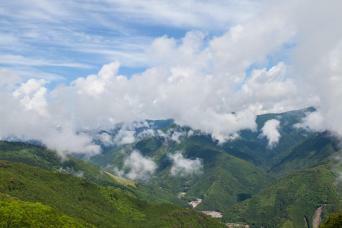 - We offer 4 to 6 day versions of our standard Kumano Kodo self-guided tour. - Our Kumano to Koya self-guided tour is 5 days long, but we recommend a night or two in the Kumano region before the hike. - We offer two versions of our Kumano Kodo Complete self-guided tour, taking in both the Nakahechi and Kohechi trails, with lengths of 9 or 11 days. Mixed village paths (paved) and unpaved forested trails. These are strenuous, but highly rewarding hikes through the mountains of the Kii Peninsula, with days of up to 8 hours walking and 3000 feet of ascent, requiring good stamina. Walking on the Kumano Kodo is more demanding than the Nakasendo – we classify the trips as ‘Strenuous’, but for an easier option, choose the 4-day tour and take a local bus to shorten the walk on Day 3 - this trip also offers local cultural activities during the days should you choose to do shorter hikes. - The standard Kumano Kodo trail is available all year (the Kumano region occasionally experiences snow from December to March). - Tours visiting the Kohechi area of Nara prefecture do see snow in the winter months, so we recommend these tours from April to November only. The Kumano Kodo Trail and the Camino de Santiago de Compostela are both pilgrimage routes with UNESCO World Heritage status. Those walking both routes can request a Dual Pilgrim Credential certificate on a complimentary basis at the Kumano Hongu Heritage Centre, located below the Kumano Hongu Taisha Grand Shrine, or at the Kumano Kodo Kan Pilgrimage Centre located next to Takijiri-oji. You may also like to request a complimentary Kumano Kodo booklet, which you can fill with stamps from various landmarks along the trail. 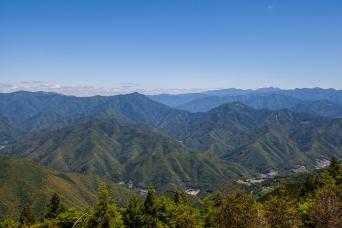 Our branch office is located along the route of the Kumano Kodo trail as it passes through Chikatsuyu village. We are proud to be part of the local community and to provide support to our guests as they walk on the trail.